Solomon in the Bible talked about ants… yes ants. I can understand why. Ants are great motivators when it comes to working hard and preparing, but in the case of this blog… gardening. Ants are always working and gathering up their food to store in their ant holes so when the cold weather comes they are well stocked. This behavior is what we should be modeling in our own lives cause we never know what is around the corner. However we do know 4 things – Spring, Summer, Fall and Winter. So we work our gardens in the Spring and Summer (and some Fall) and we aren’t so lost when winter and early spring come around. I remember as a little girl my mom sectioning off a part of our large garden just for me. I remember the sticks of wood that defined my area of about 4×5 along the left edge of the garden. If you have kids, this is a great way to provide a way to show encouragement and help them see the benefits of hard work and the rewards that follow. I can only dream of having a large garden like the one in my memories… maybe someday, but for now I’ll have to be content with my space saving techniques for my fairly small back yard. Despite the smaller size than what we had growing up, my enthusiasm is as big as it can get. In all honestly I’ve been thinking of this garden since I emptied my container gardening tools at the beginning of last Fall. This year, I’m doing a REAL garden. This year I will attempt square foot gardening. I’m going to follow the square foot gardening book and I’ve got pages and pages of notes I’ve taken from online sources about what to plant with other plants and herbs and what not to do, etc. etc. It’s quite overwhelming to be frank. So where does one start? Naturally I decide to take the hard road and try to grow from seed. I bought my organic seed packs at Walmart and I’ve got my bag of seed starting potting soil. The best rule is… look at what you eat already. Since I tend to enjoy Italian food the most I chose to go with the staples when it comes to herbs… basil, oregano and parsley. Basil is great with pasta sauces, pizza (margarita pizza please!!!) and rice dishes. I know there are a zillion other uses, but these are my basic uses. 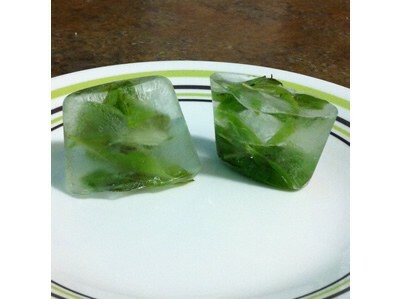 These are great to freeze in ice cubes as shown in the picture below. Oregano is great for pizza sauce as this truly is the secret ingredient. All you have to do is take your basic sauce and add oregano and your kitchen now smells like a pizzeria. Oregano also is great with meats and poultry (lemon and oregano dressing for grilled chicken is amazing!). Oregano is also super easy to grow, and it’s really forgiving. I figured I can’t go wrong with this one since I see it grow in the cracks in my in-laws cement patio. My brother in law gave me some last year to transplant and so I shoved it into a pot and sure enough it survived without much attention. When it started looking like it was dying i added water and it perked right up. But his oregano was called “Spicy Oregano” and indeed it did have a nice little kick. I recommend it to try if you like oregano. Gee, this is a great herb too and it is great for freshening your breath! Parsley is also great to add to juices cause it helps remove metals from your system (not a doctor but just do some research on it’s properties). One of my favorite recipes is my Italian breaded chicken breasts which uses chopped parsley as part of the breading. Use plain breadcrumbs since you are adding your own seasonings. There are two types of parsley that are most common – Curly and Italian. Curly is what you get when you go to restaurants while Italian is a flat darker green and slightly more bitter tasting parsley. Both are good but I recommend growing both b/c they have different uses. I love just snacking on curly parsley, and it goes great in various salads. So those are my three must haves. I am going to try and grow Cilantro and Thai basil which are my two non-Italian favs. Add them to freshly cooked rice along with some steamed vegetables and you’ve got a great little dish. And always remember, don’t be shy like I am too often. Plant more than you need because not everything is guaranteed to grow anyway. If you have an over abundance that really is great because then you have enough to freeze or dry for use during the winter and spring months. I did this last year – both freezing my herbs and drying them. My preference? Except for the basil, I prefer dried herbs. I use my Food Dehydrator and knock them out on a weekend and it works great. I recommend getting one if you take your herb growing seriously. I’ll try to post pictures as as I continue on my lovely journey. I’m not great at gardening but I’m a glutton for punishment each year as I try new techniques and love every minute of it!